We Are Sand And Finish Experts! 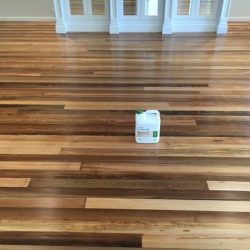 Check out how beautiful these wood floors came out! We just completed a large sand and finish job in a waterside house on the Key. For the last coat of finish we used Bona Traffic HD Satin. The floors look brand new now and with proper care and maintenance will last a lifetime. Check out our sand and finish video on this website to see our crew in action! Call today if your floors need repairs or some refreshing.